Very little has happened in F1 over the Christmas period; perhaps only the continuing speculation regarding the Force India drive being of any real interest to the fans. Giancarlo Fisichella has been confirmed and unconfirmed as Vijay Mallya's choice almost as often as turkey has appeared on the menu during the festive season, but it is most likely that the choice has not been made yet. A seemingly unrelated snippet of news had me pondering, however. Jos Verstappen will be driving in the Le Mans 24 hour race, apparently. So what is the connection between Jos and Fizzy? They both have or had Flavio Briatore as their manager and, in my opinion, he did neither of them any favors. Jos, especially, was directed into a long string of uncompetitive teams where it was almost impossible for him to show his talent. Like Raikkonen, Jos arrived in F1 with a very short history in single seat racers - just two years, first in Opel Lotus and then in German F3, had seen him win two championships and emerge as an unusually gifted driver with tremendous potential for F1. He was snapped up by Benetton as their test driver for 1994 and there he began his relationship with the Flav. The number two at Benetton, JJ Lehto, promptly put himself out for the season by breaking a neck vertebra and Jos went straight into the race car. That first year demonstrated the bad luck that was to be Verstappen's main claim to fame in F1. 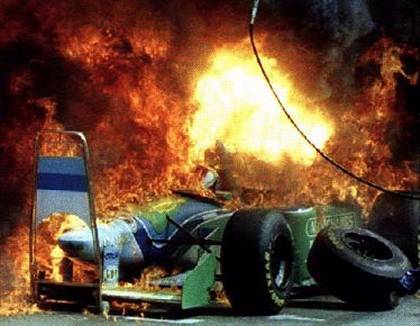 In his first race, he was tipped into a spectacular crash by the inevitable Eddie Irvine, emerging unscathed; then, in the German GP, his car burst into flame during a pit stop, Jos escaping with minor burns to his nose. It was not an auspicious debut but to be expected when it is remembered how quickly Jos had arrived in F1. Flavio then made one of those decisions that seemed crazy at the time and proved even worse - he put Jos into the Simtek team for 1995, the year they went bust. And that proved to be the pointer for the rest of Verstappen's F1 career - he went from one collapsing team to another, never getting a chance in a decent car. The list is like a record of all the failures of the past decade: Simtek, Footwork, Tyrrell, Stewart, Honda's aborted 2000 attempt to form their own team, Arrows and finally Minardi. With a series of such teams, there was little chance for Jos to shine but, even so, he managed it on occasion; have a look at this highlights video of the 2001 Malaysian GP. It is very noticeable too that wet races gave him the chance to show his ability, the car's shortcomings negated to some extent by the conditions. And, in that, there is a similarity to Fisichella's career. Although not as obviously as with Jos, rain has often been the opportunity for Fizzy to haul an uncompetitive car up amongst the leaders. Giancarlo began as Jos finished: in a Minardi. In 1997, he was given a drive by the Jordan team and rewarded them with some great performances, confirming the promise that we had all noticed. It would have made sense for him to continue with Jordan but, at this point, Flavio intervened, bringing him into the Benetton team so recently deserted by Michael Schumacher. I felt it was a bad move at the time and so it proved. Benetton had lost their works Renault engines and the car's performance suffered accordingly. Fizzy did his best and scored on several occasions but it was an uphill battle. After four years of struggle with the Benettons at a low ebb, he went back to Jordan. Rarely have there been such perfectly timed bad moves in F1. Benetton were about to rise again, ultimately as a reborn Renault team, and Jordan were on the slippery slope to oblivion. For two more years Fisichella's talents were wasted in the attempt to get a poor car into the points and it is a measure of his ability that often he succeeded. More of the same followed in 2004 when he joined Sauber. Finally, Flavio took him back into Benetton/Renault, just in time for him to be compared with the rising star of Fernando Alonso's talent. And Giancarlo's luck made sure that it was an uneven contest - after a victory in the first race of the 2005 season, Fizzy suffered a series of retirements that put him behind Alonso in the table, thereby ensuring that the team's major effort went into Alonso. It was a bitter blow to have a good car at last, only to be beaten by a young charger and bad fortune in the end. Now Fizzy stands in line at Force India, hoping for one more chance to stay in F1, a talent once bright with hope now dimmed by the passing years. And I blame Flavio. His influence on the careers of these two drivers has been unhelpful, to say the least. At times they had chances that would have seen them in competitive cars early in their careers, when their talent was still growing and they were stars in the way that Hamilton is now. Instead, they were guided into teams that were on the way out, there to feed off the scraps of occasional and fleeting success. It is no wonder that the stuffing was beaten out of them in the end and they became better respected for their setting up skills than their racing. Briatore is all very well when things are going well; when fortune turns against you, he is not the man you want negotiating your contracts. If I were a driver, I think he would be the last manager I'd want. There are people who believe that the drivers who succeed in F1 are the best and that there is a high level of meritocracy in driver achiement. Personally I have always taken the opposite view. There are some drivers who for whatever reason don't get the results or opportunities their ability deserves. Allan McNish and Mike Thackwell are two that spring instantly to mind. Both had the ability to be frontline drivers yet between them they started less than 20 GPs. Its too bad that the two things we want for the sport pull it in opposite directions. Obviously we want to see innovation and unique cars, but at the same time it would be nice to see who is truly the fastest.... But then, what would we blog about? If we just wanted to see who is fastest, it would be best to have a standard chassis and engine, as Max wants. But a major part of the drama of F1 is seeing the really good guy overcome the deficiencies of a second rate car to win. It doesn't happen all that often these days and that's why we need to loosen up the rules a bit to allow for more overtaking and for skill to count again. I'm somewhere between the view that "the good will out" and that it is all little more than a lottery. I'm too young to remember much of Thackwell, but I honestly thought McNish had his chances, and as a single seater driver was good rather than exceptional. Fisi, too was good, but not quite great. Or maybe he simply finally found himself in the right car too late in his career, when his edge had been dulled by too long spent driving second rate machinery. I don't know - personally I'm inclined to suspect he had the car control and the technique, but lacked the mental strength to succeed at the very highest level. Verstappen's more interesting. I really honestly don't think we ever got a conclusive answer one way or the other to the question of how good he was. I don't think he was exceptional - he would have needed to have shown greater edge over, say Justin Wilson at Minardi or Pedro De La Rosa at Arrows for that, but whether he could have been a front runner in the right car, I don't know. Ah yes, my beloved Webber. A great driver, but beset by possibly the worst luck in F1 - certainly in recent times anyway. What was that blog recently about nice guys not being champions???? 'Twill be a happy day in the Pink household if Webber finally wins a race. You'll be able to hear me scream all the way over in Massechusetts ! Isn't Flav Alonso's manager? Wonder what you'll think if the move back to Renault all goes sour? I am Scottish so I may be a little biased but McNish was awesome all through his single seater career. In 1988 he drove for the Marlboro sponsored Dragon Motorsport in Vauxhall Lotus. His team mate was Mika Hakkinen. McNish won the British championship and Hakkinen won the European. In 1989 Marlboro had one F3 drive available and gave it to McNish in preference to Hakkinen who managed a season in a second rate team. At that time F3 was seen as a two season championship. McNish in his only F3 season won more races than anyone and only lost the championship by a very small margin to David Brabham. There was some technical protests at the end of the season but I can't remember the details. For 1990 Hakkinen got the Marlboro F3 drive and having had a season's worth of experience beat Mika Salo to the championship. McNish went to F3000 with the Marlboro sponsored DAMS team. His car left the track at the first race at Donington and landed in a pedestrian underpass killing a spectator. Despite what must have been a horrific incident for a young driver he had a very successful season backing up his more experienced team mate (Erik Comas) who won the championship. The following year he was a huge favourite to win the F3000 championship but Lola built an absolute dog and DAMS like the other teams using the Lola achieved little all season. McNish's career ground to an instant halt. Only a one-off drive in a Porsche customer car where he performed way better than anyone else who had sat in the car led to a works Porsche sportscar drive saved his career. So instead of going on to be the next big thing in F1 he drove sportscars until Toyota gave him one season when he was in his early thirties. I have long believed that the people who run racing teams know nothing about judging driving ability and there are few better examples of this than the waste of McNish's talent. I must admit that I followed Thackwell's career more closely than I did McNish's but they both had bad luck that effectively limited their F1 chances to almost nothing. Fisichella and Verstappen are examples of drivers who have had long careers but always seem to miss the big break and there are so many more who one feels could have been very good if only given the chance. We don't see the economics involved but I sometimes wonder at the wisdom of the poorer teams putting pay drivers in rather than taking a chance on a real new prospect. Pay drivers might keep you alive for a season but that is all; discover a real talent and he could ensure the team's survival for years. Look at Minardi - some of the greats got their start because the little Italian team was prepared to take a risk. And that brings us to Webber and his sensational start with Minardi. Surely it is only bad luck that has meant he is known as the great qualifier rather than the great racer. I still hope that he finally gets the better of his luck and starts to win races. But it's really about Flavio and his overstated reputation as a talent spotter. In my opinion, he gets it wrong as often as not and the real driver manager/spotter was Ken Tyrrell. I guess it comes down to two questions. Do you need the money today? If you do you take the pay driver. Are you prepared to back your judgement by giving a driver a multi-year contract? If you are prepared to back your judgement you have to give the guy a multi-year contract. Either to keep him in your team or (preferably??) to sell his contract to a higher bidder. A lot of the people who have run back of the grid teams over the years wouldn't recognise driving talent if they had Senna in the car wearing someone else's helmet. The same can be said for some people running competitive teams. Flavio, I am certain knows nothing about the art of driving. It would be interesting to go through a list of team principals and figure whch of them could recognise driving ability without seeing lap times. I read somewhere about Senna's and Brundle's first tests in F1 cars - it was a reward for having finished first and second in the British F3 championship. Both impressed their respective teams so much that they were signed on the spot, Senna for Toleman, Martin for Tyrrell. At the time, it looked as though Brundle had the better deal but the season was to prove that Tyrrell were on the way down while Toleman were constantly improving. It is interesting to speculate what might have happened had their teams been reversed. But the point here is really that talent was recognised immediately - not surprising when you learn that Senna was breaking lap records from his first few laps onwards. So I find it hard to believe that even the worst of team managers would have failed to notice Senna - although it's true the lap times mattered too. Of the managers operating now, I think Frank Williams would be hard to beat, as hard-nosed as he is when it comes to drivers. He doesn't often pick a bad one, even when he's a bit strapped for cash. Senna and Brundle were given a McLaren test for their F3 season prize. History has a strange effect on perception and most people now believe that Senna comfortably won the F3 championship and was instantly quick in an F1 car. Neither of these are exactly true. Going into the final F3 race of the season Brundle was leading the championship. Senna had set a new record for the number of race wins in a season but Brundle had more points. Fortunately for Senna Martin's ethics were different to his own so he didn't take him out at the first corner. They both tested for McLaren on the same day and after completion of the set number of laps Brundle was faster. Senna somehow negotiated an extra run in which he beat Martin's time. So history records that Ayrton beat Martin to the F3 title and was faster the first time they sat in an F1 car. In terms of driving ability I don't think there was a huge gulf between them but their results say otherwise. Ah, it must have been a later test that Tyrrell and Toleman gave the pair. I remember that F3 season very well and you're right, Steven - it was an extremely close contest between the two of them. You must admit that it was usually Senna leading the way, however, and that Brundle just kept close enough to him to profit from any problems Senna ran into. I have often wondered why they fared so differently when it came to F1. Theoretically, Brundle should have been much better than he seemed to be - perhaps it was his bad luck in the cars he was given that made the difference. He did have a few chances to shine, however, and disappointed somewhat at those times. Senna made his own luck, of course. Brundle and Senna had a number of accidents in F3 and most of them happened when Brundle was ahead so Senna's ethics were well formed by that stage of his career. I have no doubt Senna was something very special but I do wonder why some drivers succeed in F1 and others don't. I remember a few months ago reading a thing Martin wrote. It was I think in their FF2000 season. They were racing in the rain at Silverstone. Martin was in the lead at Stowe(?) when Senna took a really odd line and drove round the outside of him. I can't remember if the race was stopped and re-started or whether they had a second race the same day but Martin decided to try Senna's line and it was hopeless. On the podium after the race Martin mentioned he had tried the line and it didn't work. Senna told him he hadn't tried it at that time because it was just too wet. As Martin asked, how did he know? How is it possible that a kid from Brazil in his second season of racing in UK could find a line no-one else knew existed and know that if it got wetter it would not work without trying it. It is almost as if he had a sense no-one else had. I remember John Watson making a similar comment which I think was about Dingle Dell at Brands. Senna bounced the car off one kerb landing on the other and carrying on like it was nothing special. Watson commented that Senna had perfected this technique and he himself had never even considered the possibility of it. That's the day he knew Senna was special. Perhaps that is exactly what made Senna so special - that he thought about driving and wondered what happened if you did something no-one else had thought of. There is a story that I presume is true about the time some US Marine pilots came over to evaluate the Harrier jump jet. One of them asked the guy explaining things to them what happened if you stuck the thing in "Up" mode suddenly while in forward flight. The instructor said that would be asking for disaster but it was clear he didn't know because it had never been tried. So, being marines, they tried it when they got their hands on the plane. One followed the other so that he could see what the lead plane did and then told him to try it. The plane in front of him vanished. In a panic, he was yelling into the intercom, asking where the plane had disappeared to when the answer came back: "I'm here, sitting on your tail, Fred." Apparently, moving the swivel jets to downwards suddenly in level flight makes the Harrier jump upwards and slow down considerably, thereby putting it directly behind any following plane. The US Marines were the only branch of the US forces to order the Harrier. As a former Marine myself that above story is the truth. We Marines tend to do things a bit different then other people. As for the entire above discussion I feel as if I was in Class at school. Man now I know that my knowledge is very small. I have often heard of F3 and F3000 as references but I have never followed them. It appears to me that I am missing some very special racing. Steer me in the proper direction kind sir. I need to learn more. Your above discussion with these gentlemen have taught me much but I want more. Do you live in Scotland. If so this would explain your knowledge to some extent. I am sure that the "lesser" series are covered more over there then here in the US. Our Speed Channel should actually be the NASCAR channel. We (in the US) need a TV channel that is dedicated to all forms of racing. I think that if all series are covered the ratings would increase. Not all Americans like stock cars. I actually am not fond of stock car racing at all. The only "lessor" series in the US that is on TV is some times Indy Lights, maybe shown on a Wed at 4 pm in ESPN 2. They used to show the toyota Atlantic series but I am not sure if it is still in existance. I also watched a Mazda open wheel race but I dont know which series it was for. When CART ran, before IRL, they had a feeder series that was fantastic driving from young drivers and was enjoyable to watch. What I am trying to say is thank you for the history lesson and if some one has some money they could start a TV channel dedicated to all racing and make more money and we would all be happier. Because gentlemen like yourselves could do spots that give us the glorious history of our sport. So as an American fan it is difficult to follow the sport as closely as a European (or a Scotsman). Turning to the web is my only solice. I have more or less always lived in Scotland. I say more or less because I have had a few spells in other countries. I find Autosport magazine is the best source of information on F3, GP2 etc. I have only recently discovered TV streaming on the net and my plan for the coming season is to find streams covering the important championships. I will post any good streams that I find. If anyone can recommend some let me know. Flavio Briatore's record for getting drivers into F1 is good - can you name me any other F1 manager who's had seven drivers make it to the top tier while Flavio's been managing them? - but his record of managing them once they've arrived isn't so great. This is largely because he has a conflict of interest - managing Benetton/Renault at the same time as running a driver management company will tend to lead to the politics of one determining the effectiveness of the other. Flavio has always wanted to have drivers he's managing form the core of his team, which goes a long way towards explaining why he tends to make his drivers go Benetton/Renault regardless of whether it's the best thing for that driver (e.g. Fisi in 1998) and can be rather cold towards those who reject his management services (e.g. Trulli in 2004). That, and the fact that he manages so many F1 drivers (two drivers in line for the one open 2005 Renault seat meant that one of them had to be disappointed...) is why he has not been as successful with the F1 phase of driver management as he could be. If I were a driver, I'd hire Flavio to get me into F1. His strike rate isn't great (I'm pretty sure I read that Flavio himself said so, but can't find the article), but he has had more success than other managers, which reinforces Steven Roy's implied point that most managers wouldn't spot a championship-winning talent if it ran over them. However, the moment I was in F1, I'd find some other management - or maybe even do a Sebastian Vettel and try managing myself. Martin Brundle was not helped in his career when he broke his ankle in a serious way at the end of 1984, but his career was probably destined to go a different path from Senna's anyway. Brundle was the sort of driver who maximised the opportunities given to him. Senna was the sort of driver who generated opportunities (even breaking the boundaries of accepted ethics to do so), and thus had a broader canvas on which to paint. WOW! A lot of long responses on this article. I'll try to shorten up my lines. Jarno Trulli was GREAT in the 2004 Renault until old Flav gave him the boot in mid-season, he had 46 points in the first 8 races, WHY dump him? Mark Webber....... is looking better but look how long it's taken and I don't see Red Bull on the podium in the near future. Then there's the other extreme........Felippe Massa........would have been a backmarker the rest of his life except for a better car! It works both ways. Speed Channel is NOT the NASCAR channel, it has real garbage like "Pinks" and "Two Guys Garage", and hours and hours of Barrett-Jackson auctions. Good shows like "Legends of Motorsport" they have dropped !!! NASCAR probably is the 'pinnacle of motorsport' these days, they generate more fans in the USA than F1 does worldwide. It's just not our chosen field. and i can tell you he made his own (bad) luck! he fell out with his parents,infact the whole village were he came from couldn't stand him,he is such an arogant b@"%&^£. i made a lot of models for a lot of people during a lot of years and he is the only one who never paid! As a building contractor myself, if a customer refuses or slow pays according to an agreement his reputation with me is shot. He could be the nicest person to babies and small animals but to me he becomes a piece of s*&^. The real person always comes out when we talk money eh!! I guess to know someone doing busineess with him is a good barometer. If rob ijbema or John F lived in the USA we'd know them as a flaming liberal Democrats........can't see a positive in anything! Sure money corupts, VOTE for someone and see what they do with your money. Several drivers have less than stellar personalities ...OFF TRACK... but that's not what we look for when the lights go out. Verstppen was a good driver as are several others named above. Jos gets my vote! And I might announce we lost another good man this morning, Franck Montagny has decided to look elseware for a race seat. Number 38'Never use the L word with me I am a die hard Republican and have been all my life. I do live in the good ol US of A. I never said that one has to be a nice person to be a good driver. As a far as I am concerned if the driver for the team I like wins I could car less if he goes home and kicks his dog. I exaggerate but I hope you get my point. There is only one prerequisite to racing and that is courage. Being fearless in the cockpit is essential. Fearless not reckless. oh and by the way I love money. I wish I had enough to be corrupted. Then I could run for office! !